Thank goodness 🙂 – a feature that automatically generates SKUs for you! 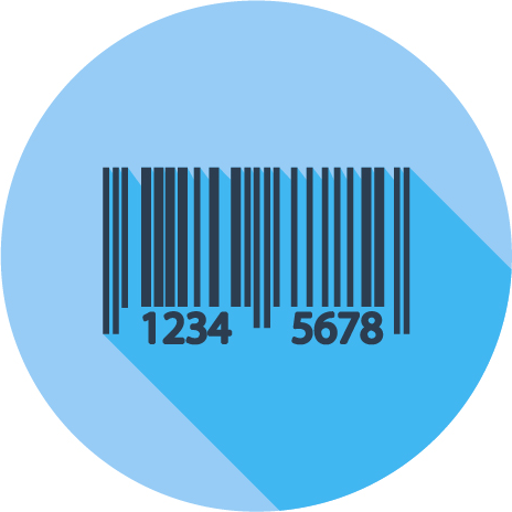 Simply enable WooCommerce SKU module, and every new product added to your store will be allocated a unique SKU number. Have existing products that don’t have SKUs? This module can do that for you too! Once enabled, go to WooCommerce > Booster > Products > SKU and scroll down to the Autogenerate SKUs tool, or go to WooCommerce > Booster Tools > Autogenerate SKUs to automatically generate SKUs for all existing products in your store. It’s that easy! This section allows you set SKU format. Number generation method. Possible values: from product ID, sequential or pseudorandom. If you choose to use sequential number inside SKU, you can set current sequential number counter here. Enables sequential number generation by category. Minimum length for SKU number part. SKU generation for variations. Please note, that on new variable product creation, variations will get same SKUs as parent product, and if you want variations to have different SKUs, you will need to run "Autogenerate SKUs" tool manually. Possible values: SKU same as parent’s product; Generate different SKU for each variation; SKU same as parent’s product + variation letter suffix. 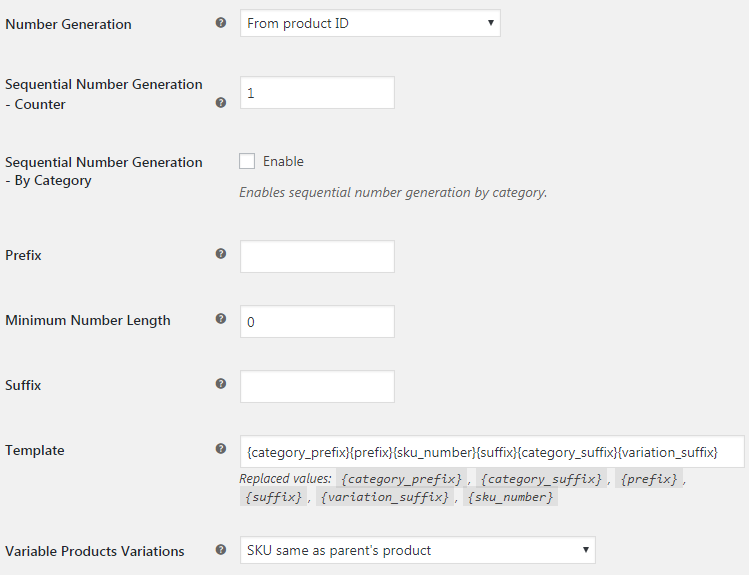 You can set different SKU prefix, suffix and counter (in case if “Sequential Number Generation – By Category” option is enabled) for each your product category. 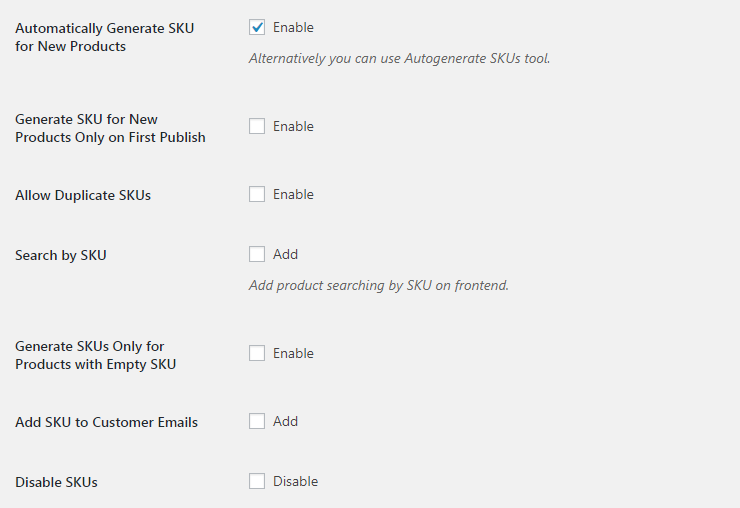 Alternatively you can use Autogenerate SKUs tool. This is important if, for example, you are using category prefix and don’t want SKU generated too early, before you set the category. 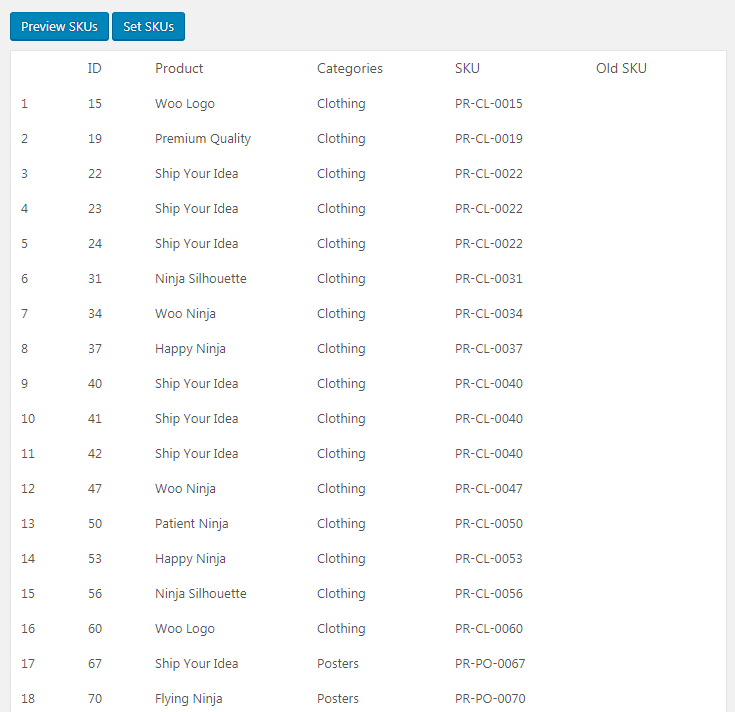 If you wish to set SKUs manually, and you need to have same SKUs for different products, you can enable allow duplicate SKUs option here (which is disabled in WooCommerce by default). Add product searching by SKU on frontend. This may help if you are going to use Autogenerate SKUs tool, but don’t want to change your existing SKUs. Adds product SKU to customer’s emails. Enable this option if you are not going to use SKUs in your shop at all. Module will generate SKUs for new added products automatically, but if you need to set SKUs for your existing products, or if you changed SKU format and would like to recalculate SKUs, you need to use Autogenerate SKUs tool. It will take format settings you set in previous sections, so you only need to click preview and set SKUs. I would like to know if it is possible to not display the SKU on the product description. I notice that if I fill a SKU reference in the product data field, it appears when I visualise the product page (in the product desciption). But in modification mode, nothing appears in the product description field.. I have the same problem with “key words” and “categories”. If I notch them on my products, they appear on the product description, but in a bad presentation. In fact, I would like not to display them as default, and customize myself them with the shortcodes. Is it possible ? Thanx a lot for your support. Oh.. I found a topic where it deals with. I’m going to try on that way too. This looks a great feature, but before I upgrade to the Plus version, a quick question. I’d like to auto generate SKU by using category. What I want is each category to have it’s own unique numbering, for example cars would be car-001, car-002,… Lorries would be lor-001, lor-002, etc and so on. Is this possible with the plus version? sorry, not possible at the moment. We will add this feature to our to-do list. We will try to add this feature ASAP. We done modification. You can test/use in dev version. You can download at http://booster.io/dev/ (need manually reinstall Booster for WooCommerce plugin). First thank you very much for looking into this and looking to make the update, appreciated. I used the link to download the dev version. Deleted previous version and reloaded from the new download. I went to the sku section but it doesn’t look like anything has changed (e.g. the same as the screen shot on the website. If it has, I’m unsure how it works. Big thanks and sorry if I’m doing something wrong. enable module, setup different prefix/suffix for product groups you need. SKU Preview. Please create option to hide parent item of variable product in SKU Preview. If product is variable, show only it viriables without parent. Its cool to export for auto-generate price list. Thanx! Please create option to generate SKU only for products with empty SKU. It allows to continue generate SKU. Sure. We’ve just made some changes to the plugin – please download the development version here – http://booster.io/dev/. You will need to uninstall the old plugin version first (don’t worry your saved settings won’t disappear). 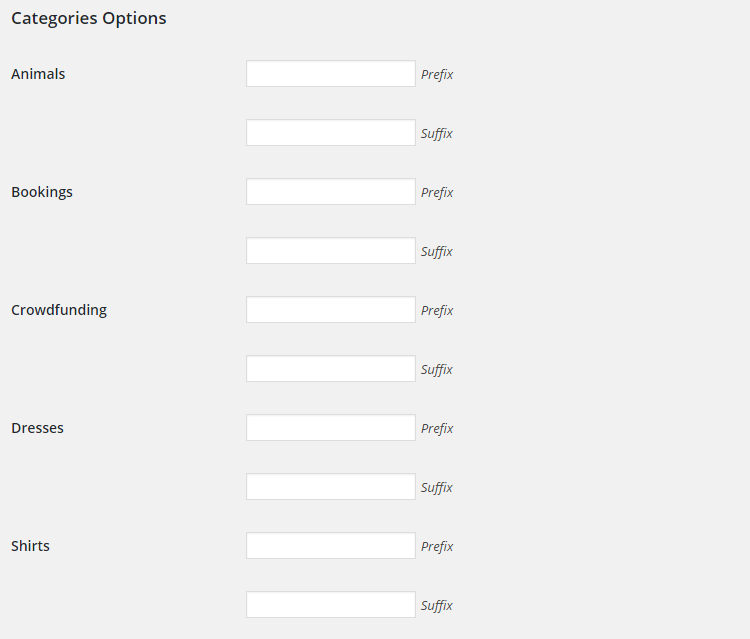 After that in SKU module’s settings (in “WooCommerce > Settings > Booster > Products > SKU”) you will find new “Generate SKUs Only for Products with Empty SKU” option checkbox. Please let me know if it works as expected. And if you like Booster, please leave us a rating. I will like to add shortcodes like [wcj_product_weight] to my sku. How can I achieve this? Is there possibility to add SKU for products variations by adding a suffix based on the attributes? Since the SKU module of your plugin will be the most used feature for us, it’s important to know the answer for above question. I just got the Plus version. However, when click on Preview SKU/ Autogenerate SKU, nothing happens (e.g. it just shows me the Autogenerate SKUs gray page with no other content whatsoever.) My SKUs didn’t change either. Hi, just bought the booster plus. Was working on SKU but not sure how to achieve this? sorry for a late response, the SKU you can create while you edit your product and below you can see General, Inventory, Shipping and etc. You need to open Inventory and here you can create the SKU for your product like you want car-saccord-1001 for example. The auto creation of SKU for variation products don’t work even I have enable the option of “Generate SKU for New Products Only on First Publish”. May you confirm whether this is a malfunction of some settings I have made wrong?